Mr. Suave's Mod Mod World: Modcast #360: Bring It On! 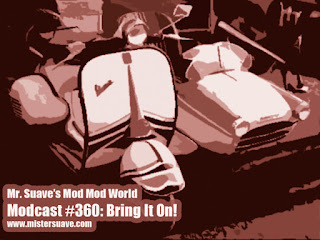 Modcast #360: Bring It On! It's time to kick off year eleven of Mr. Suave's Mod Mod World. That's right ten years in the bag and now looking towards another ten trips around the sun. In accordance with the grand and illustrious history of the show I'm sticking with the tried and true format of introducing you to some new tunes, all the while paying tribute to the greats of the past 50+ years. So, it should come as no surprise then that this modcast has everything from soul to indie pop, from power pop to R&B and even some soulful synthpop. Bring it on! Eli Paperboy Reed live at Union Pool - "My Way Home"